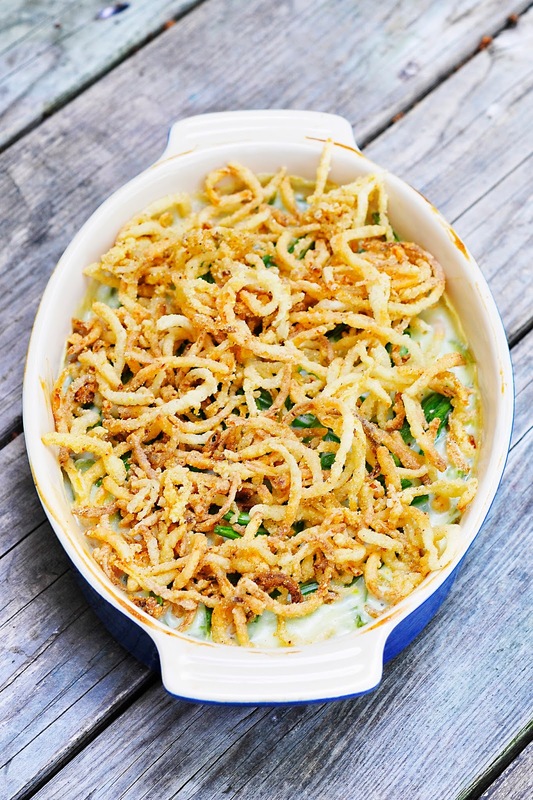 Green Bean Casserole used to be my favorite dish of all time as a kid. I was a strange kid because I loved green beans. I would turn my nose up at cooked carrots and little bowls of peas but gleefuly welcome a green bean with open arms. 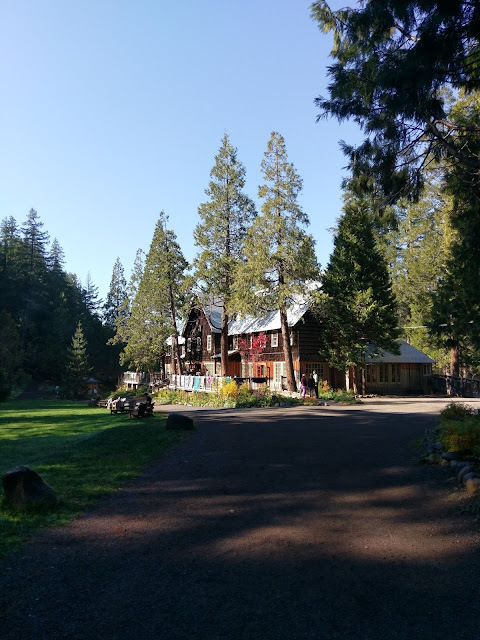 This summer I worked on a version that my family could enjoy. I didn't need to worry about making two dishes: one for them and one for me. I am pretty sure I succeeded and this is the resulting recipe. First I had to find a way to make the crunchy onion topping. I sometimes wonder if this is why I loved the Green Bean Casserole so much. 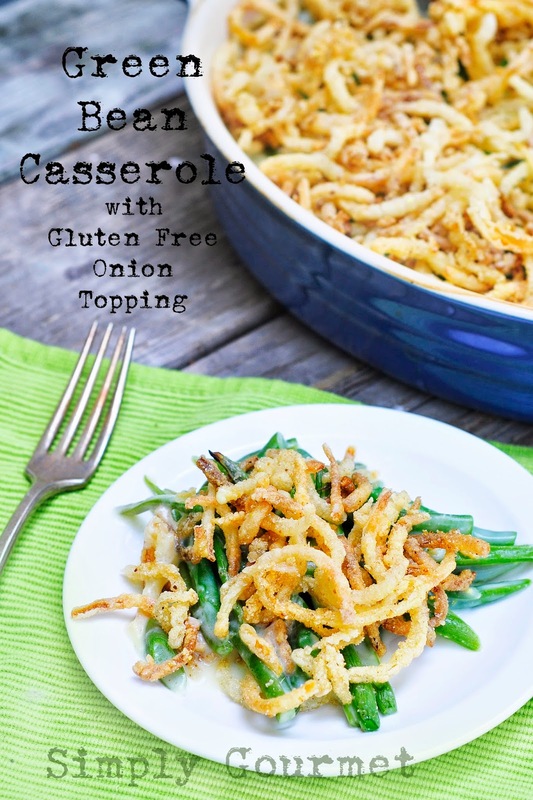 Was it truly the green beans or the crispy onion topping? I think it was both. I succeeded in making the onion straws. That recipe can be found here. The next hurdle was making the creamy sauce that is usually made with canned soup. I don't use any canned soup and I haven't in almost 5 years. I don't like the flavor, they are not gluten free and are often filled with a ton of extra ingredients that add to an odd flavor profile. I use a basic white sauce recipe but use gluten free flours instead of the recommended all purpose flour. I use a chicken stock paste to add a rich flavor along with a few seasonings of my choice. It is not a heavy sauce or an "in your face" sauce. It takes a back seat to the real star of the dish: the green beans. 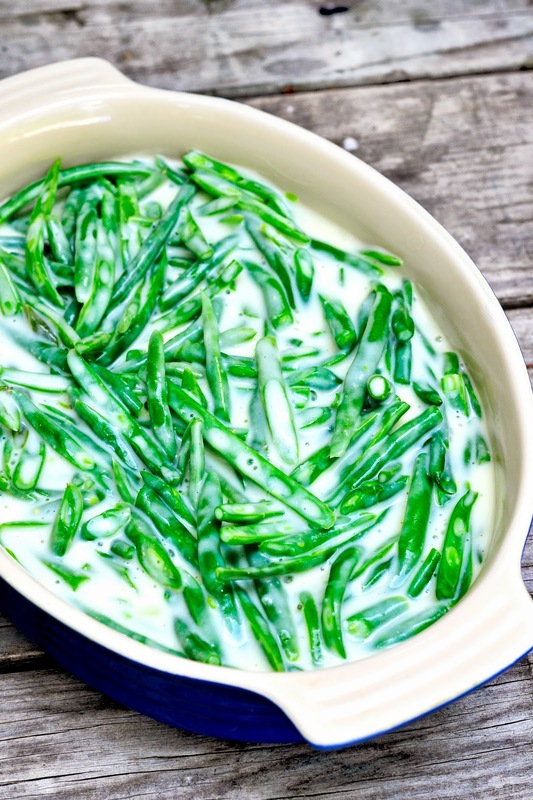 With each bite you taste the green beans as they are coated in a rich white sauce and then topped with crunchy onions. That is a perfect bite in my opinion. I went a bit crazy with my green beans and decided to cut them all at an angle to achieve the French Style Green Bean. UM, pretty sure it's not necessary. Also it took up a lot of time. I don't mind doing that once in a while but I think using whole or cut green beans will work just fine. I won't tell you to use only fresh green beans. I did and I thought it was great. The flavor was amazing. I would encourage you to use them with the hope that you have the same experience as I did. This is an easy dish to make. 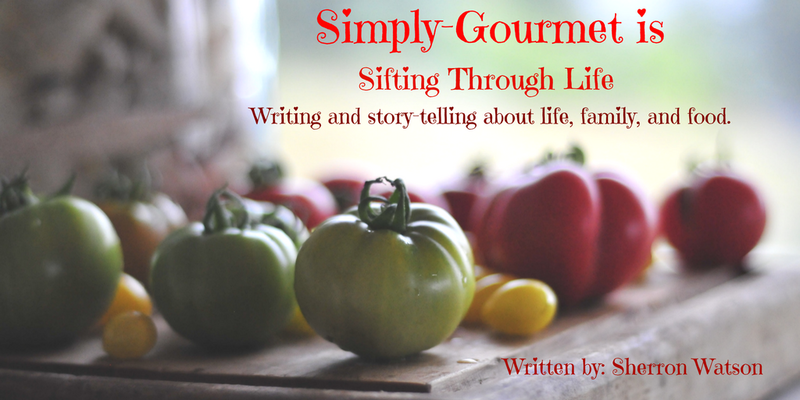 I know the canned and frozen version is easier and I understand that sometimes we need to cook this way but I will always encourage you to take a few extra steps and make your meals from scratch. NOTE: Arrowroot takes just a little bit to make a sauce thicken. I have learned through experience to reduce the amount used and not make a 1:1 trade. If the sauce is not thick enough after 1 teaspoon then add a little bit more. If too much is added the sauce will be thick and gluey. 2. 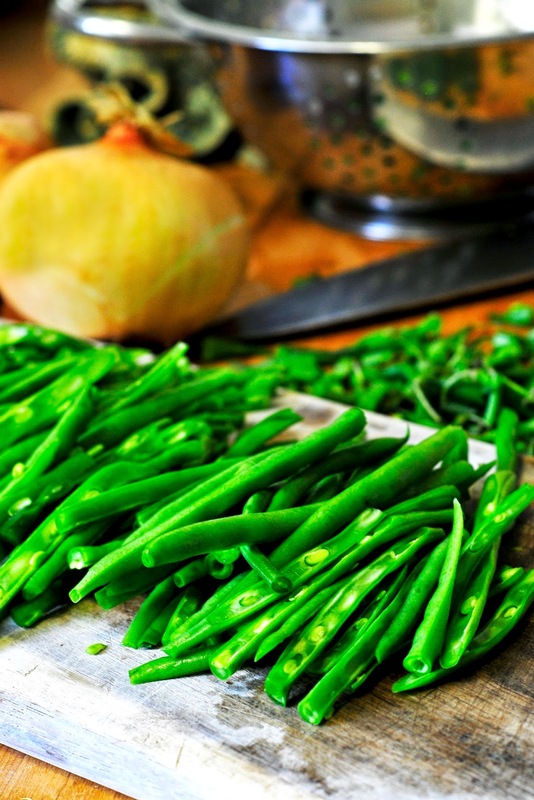 Cut green beans according to your preferences. 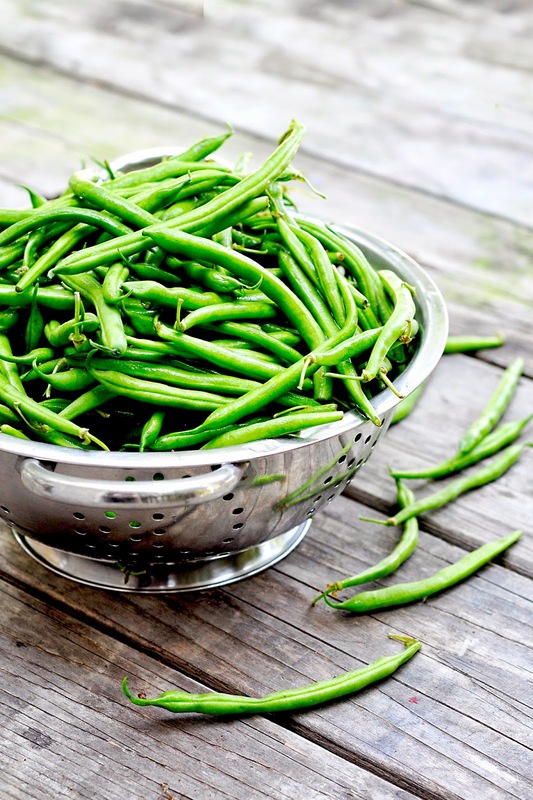 Bring a large stock pot of water to a rolling boil and blanch green beans for 2-3 minutes. They should be wilted, not too soft. 3. In a medium sauce pan melt butter. Stir in tapioca starch and then add dairy. Stir until sauce thickens. Add chicken stock paste and seasonings. Stir and taste. 4. Drain green beans and add to a baking dish. I used an oval variation which measured about 10 inches by 7. Add white sauce to green beans and stir. 5. 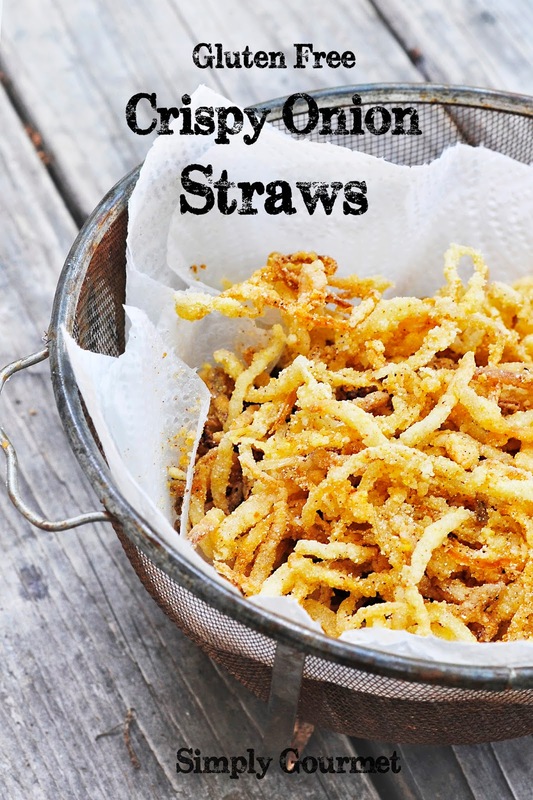 Top with crispy onion straws and bake 30 minutes or until bubbly. Let set for a few minutes before serving. Sauce will thicken as it cools. Refrigerate any leftovers.